A creamy, dreamy one-pan chicken dish? Consider us committed! 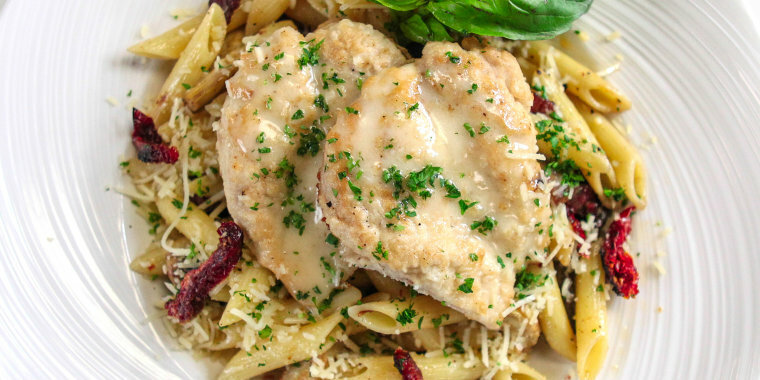 You never really need an excuse to make a salivating skillet chicken, but if you do — we think love is a pretty good one. Three years ago, Delish first shared a version of a "Marry Me Chicken" dish (because it's so amazing, you'll want to marry it, of course). And though time has passed — and other juicy, creamy chickens have come in and out of our lives — the internet is still lusting after this creamy, crispy, juicy dish that's based on a classic Sicilian dinner. So whether you're after love, trying to seduce your partner or just really like poultry, this is a good one to add to recipe box. There have even been dairy-free takes on the cream sauce, so you can prepare something for lactose intolerant. According to Delish, "Marry Me Chicken" earned its title from a taste test by the publication's editors. When they first bit into those skin-on chicken thighs cooked in the skillet and smothered in a garlicky cream sauce with sun dried tomatoes and thyme, they gasped "I'd marry you for that chicken" and "Oh my God that's marriage material." They were even so bold so as to say this "Marry Me Chicken" was better than the "Engagement Chicken" favored by culinary rockstars like Ina Garten. Legend has it that "Engagement Chicken" — essentially a classic roast chicken perfected (and a one way ticket to proposal town) — came to be in the early 1980s when Glamour magazine editor Kim Bonnell gave the recipe to her assistant, Kathy Suder. Suder made it for her boyfriend and he proposed soon after tasting this magical chicken. Since then, Glamour even published a book called "1,000 Recipes Every Woman Should Know: Engagement Chicken and 99 Other Fabulous Dishes to Get You Everything You Want in Life" and dozens of women have credited the recipe to helping them snag the ultimate life partnership. The "get him to clean the apartment burgers" also sound pretty fab. Prince Harry even proposed to Meghan Markle (now the Duchess of Sussex) while cooking a roast chicken dinner together, which Garten attributed to the magic powers of the classic dish on Twitter. Though Engagement Chicken, a whole, roasted bird with lemon and herbs, has fewer ingredients than Marry Me Chicken, it's basically a one pan dish and uses chicken thighs which are more tender and harder to overcook, making it an almost no-fail dish for anyone seeking a little more love in their life. Whether it's tasty enough to wed or lands you an Italian lover is up to you ... you'll just have to take the recipe out for a test drive on a first date.